If you are a musician looking for your first virtual world experience, think about starting in Metaplace. Metaplace is the brain child of Raph Koster - a blend of passionate visionary, thoughtful scholar, pragmatic developer and best of all, a soulful artist, writer and musician. UPDATE: Raph is playing a special Metaplace concert tomorrow, Friday Nov 29th 2PM PST. I met Raph in person in 2007 to talk about Metaplace (then Areae). It was an informal business discussion and I watched over his shoulder as he flew through the basic tenants of Metaplace, talking at speeds normally reserved for livestock auctions. We talked more over lunch (slower this time, there was chewing involved) about the future of virtual worlds, the collision of the social web and gaming, music, guitars and poetry. I won't bore you with our excursions of thought and speculation, but if I boiled down the conversation one thing predominated - the power of virtual worlds is unlocked when people can create, connect, and have fun pervasively. Imagine what that means for a musician. We could wander off and read the Mahalo text on "What is Metaplace?" but for me it's easier to think about it like this: if metadata is data about data, then metaplace is a place of places. Okay, maybe that's not easier, but you sort of get the idea. Metaplace allows you to create your own space or world that is embeddable so that it's accessible from anywhere on the web, without a client application to download (if you don't count flash) or a walled garden to navigate. It's based on the premise that you don't have to be a software developer, 3D artist or game developer to create a compelling and entertaining virtual world on your own, or in this case, on your own with a help if you need it from an engaged and collaborative community. Perhaps it's just easier if you watch the welcome video developed by Metaplace Community Maven extraordinaire Cuppycake. You can read scores about Raph's work in the development of virtual worlds, dating back to early MUD days. One thing I've learned about Raph is that despite his insane schedule as a start-up founder, he still somehow finds time to work and play and share. He was kind enough to answer a few questions about being a musician and the collision of music in virtual worlds. Q: It's relatively easy for a musician to perform live in Metaplace. Was live music always a part of the MP road map? What are the most important elements for a good performance? A: I got started doing virtual worlds back in 1992 – text muds at first, and then Ultima Online work began in 1995, and I did big MMORPGs until I started Metaplace in 2006. But I have been doing singer-songwriter stuff slightly longer, getting going by teaching myself guitar in 1990 or so. Scary to think that I have been playing for 19 years now! I was led there in part by a growing up with folk music around me, by being a huge Paul Simon fan, and then discovering the contemporary folk scene in the late 80s in high school – at the time, that was Tracy Chapman, Indigo Girls, and thence a few years later to Bill Morrissey, Greg Brown, John Gorka, and so on. Performance was not always part of the roadmap, but early on we did kick around an idea called “Stages” a lot, which was essentially a stripped down Metaplace that ONLY did online performance venues. Eventually we realized that what we had made accommodated it just fine after all! I think that a good performance online is in some ways very different than one in a venue. I really feel the “absence” of the chatter and the crowd while playing – it’s more intimate and more distanced at the same time. You can focus on the music without distractions, but you can’t feel the crowd in the same way. Also, there’s more reverb… seems like you have to drown the signal in it to sound OK online. Q: How do you see live performance shaping the future of Metaplace, or virtual worlds overall? Would you encourage fellow musicians to add virtual worlds to their tour schedule? A: I don’t know what the future of live performance is in virtual worlds. I have come to realize that the challenge is getting people to show up, regardless of venue. A virtual venue is only marginally easier to get to, depending on circumstances! I don’t any reason why musicians shouldn’t include virtual worlds on their tours. It may not bring in as much revenue as a well-attended show, but on the other hand, there’s no travel costs. So yeah, it’s totally worth adding to the schedule. Q: You mention on your blog that you attend Kerville Folk Festivals have met a lot of professional singer-songwriters. Can you share one of your favorite or most memorable encounters? You could take that last Raph quote and change "folk community" to "metaplace community". Like every virtual world, there are people behind most of those avatars and while you can't avoid a few miscreants, Metaplace has a great feel of community about it that starts with Raph who spends time in world on a regular basis and extend to the Metaplace staff and cast of resident volunteer helpers. What about music in Metaplace? One of the first people I met in Metaplace was Swedish musician Fredriksson at his Folk N Coffee Cafe. Fredriksson, now a Metaplace "guru" was then working with Raph on ways to stream live music into Metaplace and reached out to see if I could help. They already had all the pieces in place, all I really had to do was show up, connect my stream to Raph's Metaplace guitar and viola, that night we were dual streaming in both Second Life and Metaplace. This was a perfect example of Raph's vision to make experiential worlds accessible and entertaining. Overall, the music scene in Metaplace is still nascent but the community itself is active and engaged thanks to some amazing community leaders like Cuppycake and Amethyst. 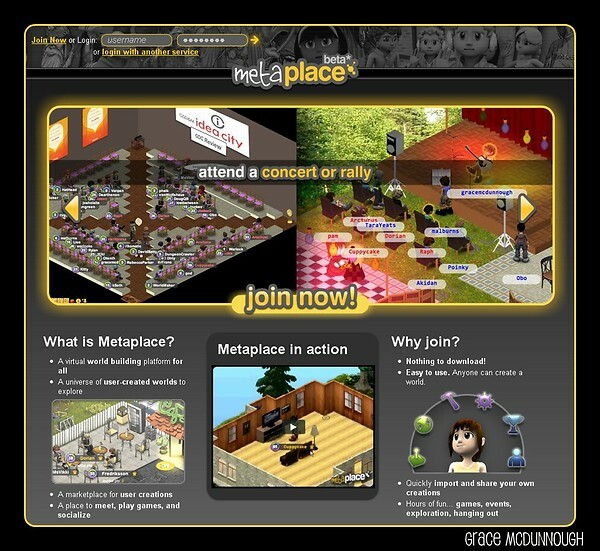 Metaplace was one of the first virtual worlds to host Koinup's Rocking the Metaverse Tour where Cuppy and team pulled out all the stops by developing The Lotus Room as a premiere performance venue. Raph has played live concerts himself and recently delivered an amazing two hour set in world for Halloween, you can listen to it here. Several other well-known Second Life musicians have found their way to Metaplace including j9scarborough, Onehempcat and Al-Hofmann but the world is vast and you can develop your own venue and be playing live in very little time. You can check out some of the Metaplace music venues here to give you some ideas. What about the technical set-up? If you need help with the technical set-up, there is no better reference that the "Doing Live Music in Metaplace" post on Raph's blog. Metaplace also has an entire forum dedicated to sound and music where you can get help just by asking. When you are ready to schedule your event, be sure to post your live concert to the event calendar so people know where and when to find you. If you are hoping to make a few dollars, listeners can pay you in either Metaplace coins or there is also a tip jar in the marketplace that allows you to take Paypal contributions. So give Metaplace a try, it's free, easy and you'll learn a lot about performing in front of a live audience and when you get there, look me up and say hello. You can hop in right from here and get started. Awesome piece Grace! Raph is an ispiration for all of us working and "building" stuffs in Virtual Worlds. I'm still thinking that music could be "one of" the killer apps for virtual worlds going mainstream! Excellent. I'm filing this blogpost under "understanding music culture in virtual worlds."